Case's practical pocket knives are some of today's best choices for everyday use. Case knives gather few concerned glances if pulled out discreetly for some minor emergency at the restaurant table or bus stop. 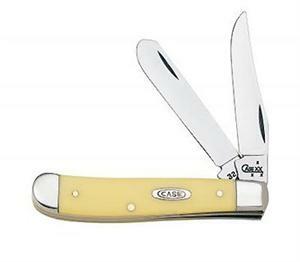 Made for work rather than tactical situations, Case's older styles like this 3-1/2 inch (folded length) Yellow Handle Mini Trapper date back to times when most people worked in forests and on farms. Built to handle older emergencies like harness troubles and the occasional rock stuck in a horse's hoof, these old concepts work as well on modern simple problems. The Mini Trapper's main blade, a clip point style meant for general purpose farm work and wherever you need a sharp point, is called the California clip. The story behind that name is that the stainless steel blade vaguely resembles the state of California (only if you count the tang). Both blades pivot from the same bolster of the slightly asymmetrical handle, but the cross section is small enough that there's no imbalance in use (unlike the more awkward and complex Swiss Army knife). The spey blade, nearly as long as the clip point but with a rounded tip, found use on farms as a castration blade. Today, it's used for any purpose requiring careful slicing instead of puncturing. The yellow handle slabs may have the look of old ivory but actually are a modern synthetic called Delrin. Like most aspects of Case knives, Delrin has been around long enough to trust.